^ Wingfield, Nick. Game Maker Without a Rule Book. The New York Times. 2012-09-08 [2012-09-09]. ^ Dudley, Brier. A glimpse of Valve’s Steam Machine, controller design and hardware plans. Seattle Times. 2013-11-04 [2013-11-04]. ^ Half-Life 2: Raising the Bar. Prima Games. 2004: 10. ISBN 0-7615-4364-3. ^ Marc Laidlaw On The Cancelled Half-Life Spin-offs: Return To Ravenholm And "Episode Four". LambdaGeneration. 13 January 2012 [19 July 2013]. （原始內容存檔於2012年1月16日）. ^ The World According to Gabe. PC Gamer. 2006. （原始內容存檔於2013-01-27）. ^ Valve SOB Project Was Called 'Stars of Blood'. ValveTime.net. 11 November 2012. 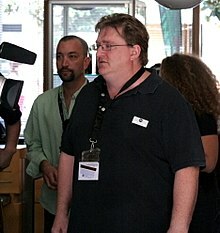 ^ Gabe Newell On Valve’s "SOB": "'Stars of Blood' Was An Internal Project That Never Saw The Light of Day". LambdaGeneration. 12 November 2012. ^ Valve were making a fairy RPG before Left 4 Dead | Interviews, News. PC Gamer. [2013-03-23]. ^ Steam Surpasses 30 Million Account Mark. Valve Corporation. 2010-10-18 [3 November 2010]. ^ Davies, Marsh. Valve confirms Steam Box – a "very controlled" PC for the living room. PC Gamer. 9 December 2012 [21 April 2013]. ^ Newman, Jared. Valve’s Steam Box: The plot thickens for PC-based game consoles. PC World. 18 March 2013 [21 April 2013]. ^ Steam Machines. Steam. 2013-09-25 [2014-02-18]. ^ It's Ugly: Valve Sues Activision, Activision Threatens to Sue Valve. gamepolitics.com. 2009-04-30 [2009-05-01]. （原始內容存檔於2009-05-02）. Against that backdrop, Activision cut Valve a check last week for $1,967,796—the amount handed down by the arbitrator less the disputed $424K. According to Valve's suit, Activision said that it wouldn't pay the rest and if Valve went to court Activision would countersue. Valve has apparently called Activision's bluff and the parties are now once again at odds. ^ Augustine, Josh. Riot Games』 dev counter-files "DotA" trademark. PC Gamer. 2010-08-17 [2011-08-19]. ^ Plunkett, Luke. Blizzard and Valve go to War Over DOTA Name. Kotaku. 2012-02-10. ^ Reilly, Jim. Valve, Blizzard Reach DOTA Trademark Agreement. Game Informer. 2012-05-11. ^ Claire Suddath. What Makes Valve Software the Best Office Ever?. Business Week. April 25, 2012. ^ Claire Suddath. Why ThereAre No Bosses At Valve. Business Week. April 27, 2012. ^ Valve Handbook for New Employees (PDF). Valve Corporation. [17 January 2013]. （原始內容 (PDF)存檔於2012年11月15日）. ^ Warr, Philippa. Former Valve Employee: 『It Felt a Lot Like High School』. Wired. 2013-07-09 [2013-10-08].